KUWAIT (Reuters) - Kuwait's foreign minister said on Wednesday that a long-awaited U.S. peace proposal for the Middle East should be acceptable to all stakeholders and factor in regional considerations. U.S. President Donald Trump's special adviser Jared Kushner visited several Gulf Arab states last month - but not Kuwait - to seek support from Arab leaders on the economic portion of the proposal that Trump is expected to unveil in the coming months. Kushner, Trump's son-in-law, has given a broad outline of the plan, saying it would address final-status issues of the Israeli-Palestinian conflict, including establishing borders. "We hope the plan will take into account the situation in the region and all the relevant parties," Sheikh Sabah Khaled al-Sabah told a joint news conference with U.S. Secretary of State Mike Pompeo. "We believe the strong relationship between the United States and several countries will lead to an acceptable resolution to all parties and to reaching a political solution that has been long waited for." Kuwait currently holds a non-permanent seat in the U.N. Security Council, where it has championed the Palestinian cause. Pompeo is on a regional tour that will also take him to Israel and Lebanon. The foreign minister of Kuwait said he had also discussed with Pompeo a Gulf dispute that has fractured the Gulf Arab bloc, as well as Syria, Iran, Iraq and Yemen. The United States and Kuwait have been trying to mediate in the bitter row that has seen Saudi Arabia, the United Arab Emirates, Bahrain and non-Gulf state Egypt impose a political and economic boycott on Qatar since June 2017 over allegations it supports terrorism. Doha denies the charges. "We are all working to find a solution. It's not in the best interest of the region, not in the best interest of the world. 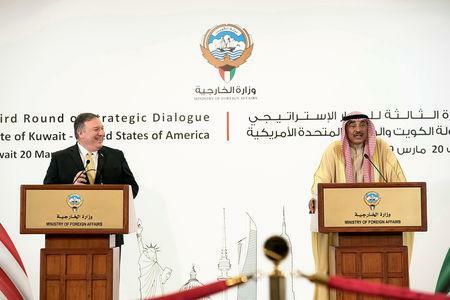 We need Gulf countries all working together on the complex set of challenges that face each of them," Pompeo said. Sheikh Sabah said "there is no option" other than for the dispute to be resolved. 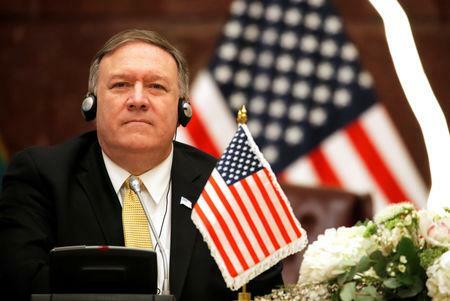 The United States, an ally of the six-nation Gulf bloc, has said that regional unity is essential for a planned Middle East Strategic Alliance that would serve as a bulwark against Iran. Qatar is home to a major U.S. airbase and Kuwait also hosts U.S. troops. 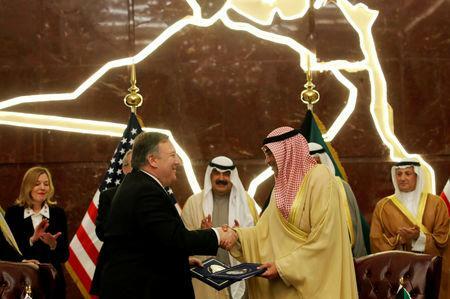 Pompeo said his talks on Wednesday also focused on enhancing defense and cybersecurity cooperation with Kuwait.